Mad Max is an action game for PS4, Xbox One and PC with strong inspiration in the eponymous film franchise, with full of adventures. For example, survive in the Wasteland, the main scenario of the game, can be a complex task for users. The basic controls in Mad Max are a bit muddled because flee the pattern of many action games in the third person. Max to run, the player must hold one of the control of the rear triggers (R2 in the PS4, for example), while the jump is enabled with other style button. Despite little practice, this is a considerable issue. The control to shoot can also confuse enough. To aim, it uses one of the top buttons of the front (as L1 / LB) and shoot with the trigger back (R2 / RT). The game teaches the basic moves, but only practice will make you a star. The Mad Max fighting system resembles other titles from Warner, as Mordor Shadows and Batman Arkham Knight. Combat is done with only two basic buttons: coup and counter-attack, with some variations in other keys, such as dodging with R1 / RB. To fight the right way, press the punch button continuously for a few seconds longer than normal. Thus, you will apply the blow more effectively. Pay attention to the label on the heads of opponents and press triangle / Y to block the attack and counterattack correctly. 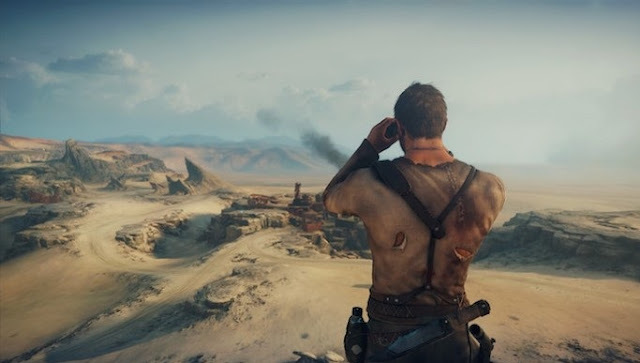 Mad Max is a difficult title to survive than other open world adventure games. When the protagonist suffers damage, the hero does not automatically restores life to the rest, unless you go back to the base. To heal, you need to find food or water. Water and food are easily found in enemy camps, but the character will always need to drink and eat to stay healthy. With this, it was simple can become a difficult task. To recover life, just stop for a while and feed. Unlike the controls to move Max, the commands to drive the car, fortunately, they are intuitive, practical and work very well. Don’t bother to get off track because there is no clear division. In fact, what happens is that the vehicle slows down outside the indicated track, but it's nothing that really hinders both the car's performance. In the world of Mad Max, everything is usable. Any object can become a powerful addition to or a new weapon. The game offers of destroyed item remains, called scrap, but that serve as the title of the currency. So make no mistake: collect all that is highlighted in yellow on the screen. Scraps help to improve the vehicle, weapons and even Max skills. Thus, it is important to remember that virtually everything stops debris from defeated enemies to cut down towers or other wrecked cars. Try not to leave anything behind. The Magnus Opus, New Car Max in the game, is the heart of gameplay and also a strong element in the mythology of the saga. More than take care of Max or upgrade the weapons, you need to add improvement to the car constantly. The vehicle is life in Mad Max, in a way. The wilderness without the powerful would be suicide, so you better not run away from investments in Magnus. The most fun is that the car is quite customizable, and therefore you will hardly get bored to modify details. What would Mad Max if not for fighting on four wheels? Anyone who has watched the latest movie knows that cars are an important part of the plot. The battles between vehicles are present from the feature film of the franchise first but gaining strength in "Mad Max: Fury Road." In the game, you will need to fight different types of enemies and vehicles. Then, use the car without fear of turbo as well as maneuvers and weapons to destroy enemies. If the protagonist is too damaged, try to stop for a few seconds until the car is recovered. Gasoline is another valuable item in Mad Max. As the hero needs water, the vehicle needs fuel frequently. But don’t worry: you can find gasoline in opponent’s camps.